The Côté Sharp Family Foundation is donating $5 million to help create a new centralized wellness centre. 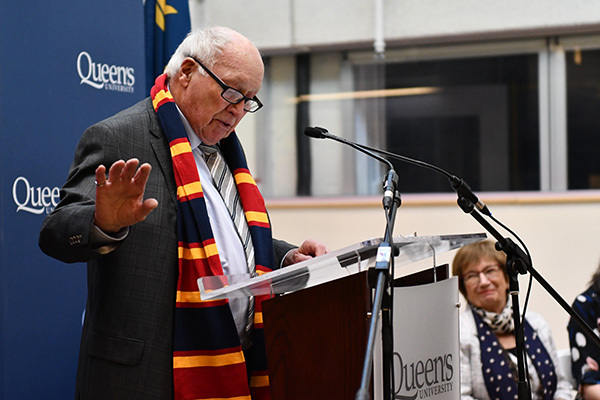 Daniel Woolf, Principal and Vice-Chancellor, today announced a $5-million gift from Dennis Sharp (Sc’60) and Hélène Côté Sharp to support Queen’s University’s commitment to promoting student health and wellness. In recognition of this gift, the Côté Sharp Student Wellness Centre will be an integral part of the new Innovation and Wellness Centre (IWC), located in the heart of the Queen’s campus. In the Côté Sharp Student Wellness Centre, students will learn about health and well-being, build skills, receive excellent medical and counselling services, and access academic accommodations for wellness-related needs, including medical, mental health, and disability. A diverse and specialized team of doctors, nurses, occupational therapists, personal counsellors, social workers, psychologists, psychotherapists, psychiatrists, accessibility advisors, and support staff will offer comprehensive services in the new space. The Innovation and Wellness Centre is built upon the former physical footprint of the Physical Education Centre (PEC). The PEC was always a place where students, staff, and faculty came together to pursue their extracurricular interests and their health and fitness; the IWC continues this tradition. Along with the Côté Sharp donation, significant contributions from fellow alumni, the federal and provincial governments, and other friends of Queen’s will enable the Innovation and Wellness Centre to be the hub for innovation at Queen’s, with state of the art engineering facilities and increased innovation facilities for both students and researchers. The Côté Sharp Student Wellness Centre joins the Beaty Water Research Centre as two of the first named facilities within the IWC. In February 2017, water research got a new home thanks to a $5 million gift from Ross J. Beaty. The Beaty Water Research Centre will include 8,000 square feet of new lab space, and join other experiential learning and research spaces in the IWC. The centre is set to open in fall 2018.